Moku:Lab’s Oscilloscope features two 500 MS/s analog input channels with 200 MHz analog bandwidth, 10 Vpp input voltage range, and user-configurable AC / DC coupling and 50 Ω / 1 MΩ impedance. 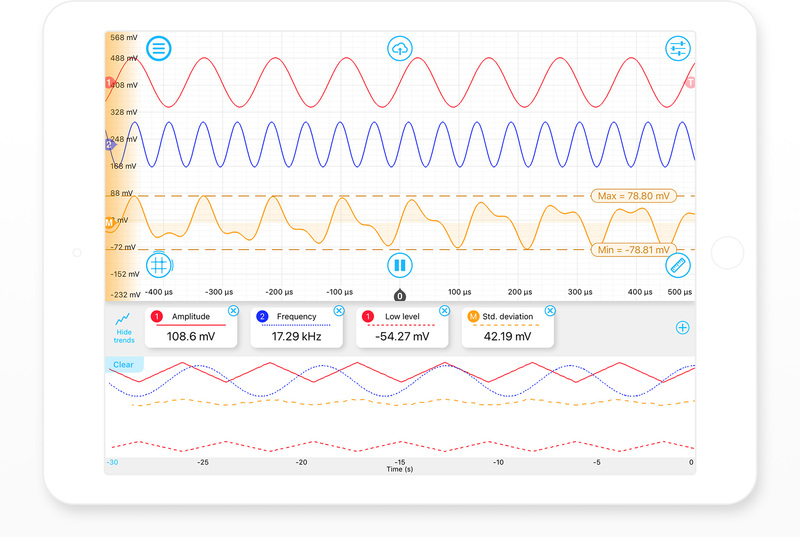 The Oscilloscope also features two integrated waveform generators capable of producing sine waves at up to 250 MHz and square, sawtooth and triangle waves at up to 100 MHz, enabling it to stimulate a system and measure it’s response simultaneously. from an intuitive iPad interface, or with Python, MATLAB, and LabVIEW. Wirelessly monitor signals and configure your Moku:Lab hardware, all from an intuitive iPad interface, or with Python, MATLAB, and LabVIEW. Can I set the channel offset in screen divisions while zooming? To zoom in and out while keeping the channel offset fixed on the screen, simply pan up or down with two fingers held together. This 'rapid zooming' technique works horizontally and on other instruments as well! What is the difference between "Normal" and "Precision" acquisition modes? Moku:Lab records samples from the analog inputs at a rate of 500 MS/s. When looking at long time spans, the data's sample rate is reduced to display the trace on the screen. In "Normal" acquisition mode, the input is simply downsampled; that is, only every Mth sample is taken. This can cause aliasing of high frequency signals: for example, a high frequency sine wave may appear as a lower frequency sine wave when the oscilloscope timebase is zoomed out. In "Precision" mode, the input is lowpass filtered (averaged) before downsampling. This reduces aliasing artifacts and increases the resolution of the trace. Note that in this mode, high frequency signals can be filtered out, so the oscilloscope trace may appear to be zero even if a high frequency signal is present at the input.